Cornwall's only civil owned airfield which is available for general aviation has been put up for sale. Perranporth airfield on the cliffs in North Cornwall has a guide price of £950,000. Its current owners are retiring. The 330 acre (134 hectares) was originally built as a Spitfire base in World War II. 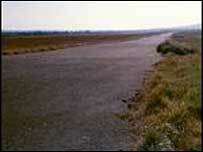 The airfield was built in 1941 for the RAF. It has three hard surface runways and two grass strips.